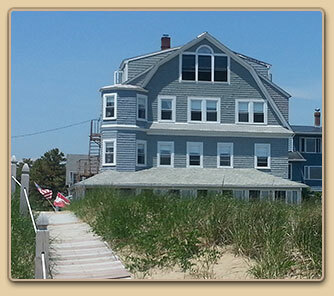 Welcome to The Nautilus at Ocean Park, an ocean front bed and breakfast in southern Maine near Old Orchard Beach and just a short drive from Portland. There's nothing between our cozy bed and breakfast and the water except the smell of sea roses, grassy dunes and seven miles of white sandy beach. Protected by off-shore islands, this scenic lodging location provides spectacular sunrises and invigorating surf - a perfect spot for rest and relaxation, yet there are many types of vacation activities close by. Enjoy the beauty of the ocean and explore some of the nearby towns like Old Orchard Beach on Saco Bay along Maine’s coastline from our convenient location.